Hello dear! A special festive guest brought early Christmas excitement to a Telford Nursing Home. 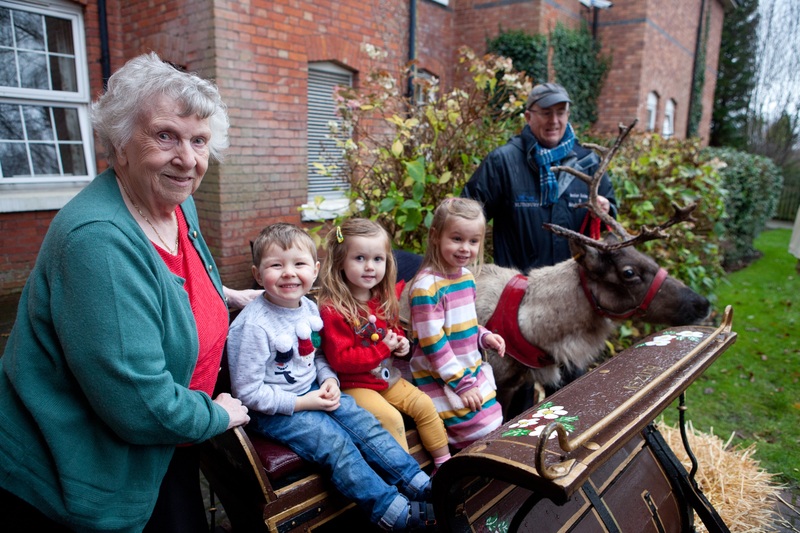 Morris Care Centre in Wellington welcomed George the reindeer with his sleigh and handler Hugh Stewart from Blithbury Reindeer Lodge near Rugeley, to create a magical experience ahead of the big day. Delighted residents patted and fed their Christmas visitor and were joined by excited youngsters from neighbouring Tortoise Nursery who sang ‘Rudolph the Red-Nosed Reindeer’ to welcome him. The visit was organised by the Home’s Social Life Co-ordinators Paula Knight and Lorna Green who entered the fun by sporting antlers and shiny red noses. Paula said: “George the reindeer was a big hit with everyone. It was a magical day and a great way to get into the Christmas spirit. We organise a variety of activities to create engaging and memorable experiences for our residents and this was certainly a special one.